This beautiful solid cherry viewer will literally be the gateway to your world, making possible many unforgettable presentations of your talent. The workmanship is superb and your clients will find it a joy to hold, but it's what they'll find inside that will leave them astounded: Your best work, documented with the uncompromised quality of AccessZ High-Resolution Stereographs. Short of showing them your creations first-hand, nothing can bring your clients closer to appreciating your talent. 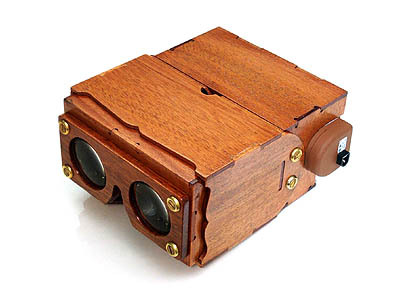 The SaturnSlide™ Stereo Viewer is the finest instrument available with which to view our stereographs. The Viewer and companion Lightbox can be purchased as unassembled, unfinished kits directly from Rocky Mountain Memories, but AccessZ will assemble and finish them for you at a very reasonable markup. We offer this service exclusively to our clients to reduce their initial cost of starting an AccessZ Portfolio. Read about the AccessZ High-Resolution Stereographs we can produce for your viewer, see the reviews we've received or contact AccessZ for more information! * "SaturnSlide" is a trademark of Alan Lewis, the viewer's designer and manufacturer.